Memory can be highly selective. The way one recalls a given event with absolute certainty may not at all be the way it actually happened. Such is the case in Harold Pinter's 1971 work Old Times, which is currently enjoying a sterling Broadway revival as presented by the Roundabout Theatre Company at the American Airlines Theatre. Filmmaker Deeley (Clive Owen) and his wife Kate (Kelley Reilly), who live in a converted farmhouse somewhere near the English coast, are awaiting the arrival of Kate's old friend Anna (Eve Best), who is arriving from Sicily for a visit. Anna and Kate shared a London flat together when there were young women recently out of school. Though curiously, Kate has never before mentioned this woman from her past. While Deeley seems eager quite to meet Anna, and thus perhaps get a peek into his wife's life in the time before he knew her, the more introverted Kate is far less enthusiastic. Perhaps preferring to let those heady days of youth and the escapades thereof - all occurring at a time when the future was completely open to her - remain safely buried and forgotten. Not long after Anna arrives, a not-so-subtle disconnect begins to occur. Deeley and Anna taking up most of the conversations, be they reminiscing, questions, or swapping song lyrics; with Kate becoming a sort of third wheel. Kate at one point remarking how Anna keeps talking at her as if she's dead, even though she's right in front of them. This feeling of exclusion existing not only in terms of the conversations going on, but also in Kate's relationship with her husband. Deeley traveling all over the globe for his work, while Kate seems to prefer the solitude of her present environment. She often taking walks alone, with her only constant companion her thoughts. It's as if she's continually erecting a safe haven for herself. One with ever taller walls. It also becomes apparent that Anna and Deeley had a significant, albeit non-verbal encounter during those long-ago London days. Though each has their own interpretation of what may have happened during that meeting. Just as Kate and Anna each have their own interpretation of that time; especially how things finally ended between the two women. This then brings the story back to the idea of selective memories. Where people chose to remember the same instance(s) in different ways. Preferring to recall things they way they wanted them to happen, rather than how they truly did. Playing hand and hand into premise this is director Douglas Hodge's excellent staging. His firm yet delicate pacing helping to keep the audience fixated on the unfolding story, as well as the slowly increasing sexual tension, as they wait for the explosion, surprise or other clues to solve the mystery of these three people, as well as Anna's ultimate purpose in showing up after all these years. Though those wanting straight answers or a complete linear progression have come to the wrong play; for there are no quick fixes or the neatly tying up of all that has been presented. Rather, Pinter leaves it to each person in the audience to digest and make sense of what they've seen. 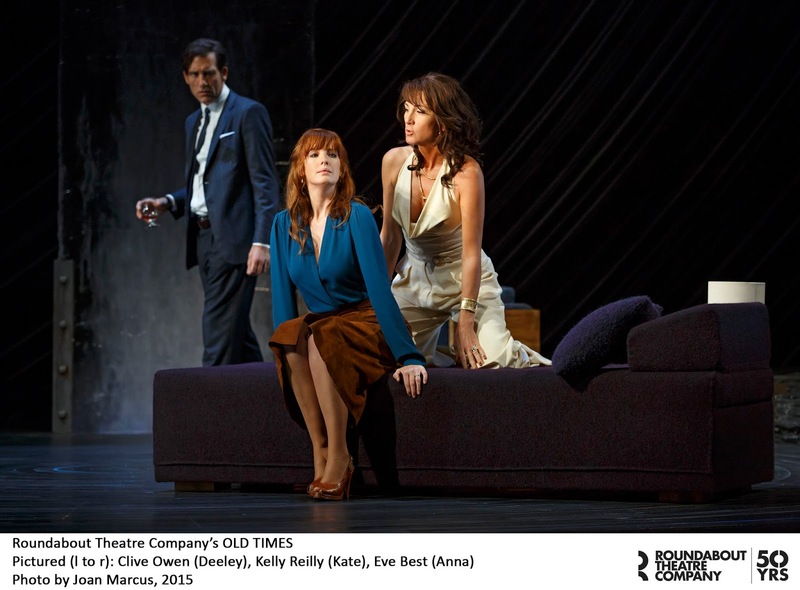 It's also interesting to note that throughout the play Kate and Anna are often positioned in such a way that they appear to be almost mirrored images of one another. This then begs the question which of them is image and which is real. Or perhaps the question should be which is more image and which is more real? Also present is an almost desperate need by Deeley and Kate to maintain their own personal status quos. Deeley continuously trying to keep control of the situation by one-upping Anna during their conversations, while Kate tries not to revisit the past by seemingly ignoring it. Or at least playing it down for as long as she can. Yet in the end, both are threatened with losing the security and stability they desperately covet. For by the end it is Deeley who finds himself being pushed aside, while it's Kate, who has been relatively quiet for most the show, who ultimately finds her voice and seizes control of the narrative. Acting by the trio is excellent. Especially when one realizes that none of the characters are quite fully formed. Rather they're more bits and pieces of experiences and memories. Yet the material the actors do have to work with and the possibilities therein make the characters completely fascinating to watch. Owen, making his Broadway debut here, cuts an interesting figure as Deeley. Someone a little too self-assured, with a constant need to be in control and wanting to learn as much as he can from Anna. But who in the end, learns that a little knowledge can be very dangerous. Reilly, also making her Broadway debut, is good as Kate. A quiet soul with an almost mousy sort of attitude at points, who eventually shows herself to be the strongest person of all. Best, as Anna has perhaps the more difficult of the three roles. A sort of cipher inside this cipher of a play, as the woman whose presence stirs up things the other two had long forgotten, or at least conveniently suppressed. That is, if any of the memories in question are actually true to begin with. Christine Jones' set, like the characters, is deliberately incomplete, but comfortable. In another interesting point, the front door almost resembles a huge block of ice. Perhaps indicating how each of the characters is frozen in time in their own way. Or, since if you look through a sheet of ice, everything looks like it's in a million pieces, it could be another reference to the fragmentation of memories distorted by time and distance. Special mention going to the haunting sound design of Clive Goodwin. Its ominous and enveloping mantra fitting perfectly into this story. Running a brisk 70 minutes, you still feel as if you've been through an emotional marathon by the time the play is finished. Old Times is a gut-wrenching yet at times almost gentle look at the power of memories. All the while showing that if the truth doesn't always set one free, it can certainly mark those who are able to remember it accurately. Featuring: Clive Owen (Deeley), Kelly Reilly (Kate), Eve Best, (Anna).